Well, wasn’t it just about time for us to check up on just how that French socialist multiculturalism escapade has gone, following on from Francoise Hollande and all the other EU cronies like President Emmanuel Macron, have now suffered another ISIS terror attack in the sleepy town of Trebes, France. Do not be alarmed, since this is the season coming for terror attacks. Well, especially in France, right? Yes, the French, who have a history of waving the white flag, have been hit with yet another terror attack by an ISIS gunman this morning, screaming “Allahu Akbar”. 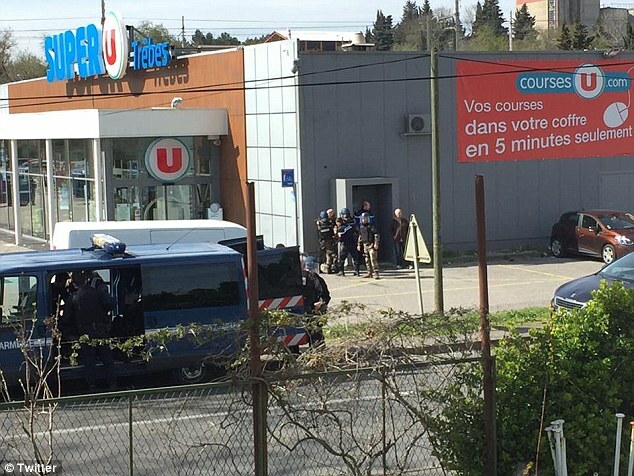 The gunman stormed a Super U shop in Trebes, south-west France and took hostages this morning, where shots were heard and the words, “Allahu Akbar, I’ll kill you all” and “vengeance for Syria” was shouted by the ISIS terrorist. The same gunman had earlier shot and injured a policeman in Carcassone. He had opened fire on them while they were out for a run, before driving off. 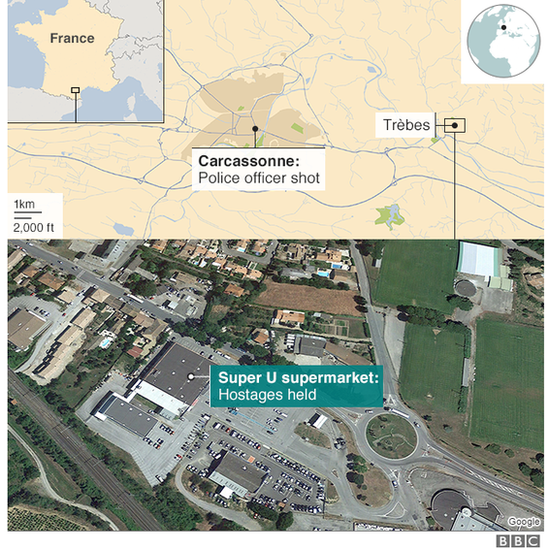 The ISIS man then took off to a Super U supermarket where he took hostages at around 11:15am, whilst many terrified French people fled the scene, but two people were killed by the gunshots and several hostages were taken. It’s believed that several people are currently injured. Town Mayor Eric Menassi said that the hostage taker believed to be in his 30’s, is alone inside the supermarket with one police officer inside, whilst all the hostages had already been freed. However, PM Eduoard Phillipe said this morning that the hostage situation was still ongoing, and that it was a “terrorist attack”, after the ISIS gunman, fifteen minutes beforehand had injured a police officer in Carrascone, although, it is said the officer is expected to live. Mayor of Trebes Eric Menassi confirmed that a supermarket worker was killed and that a CRS officer was wounded in the shoulder. But latest news is that another person has been killed in the supermarket, as well. The hostage taker has earlier claimed allegiance with ISIS, according to BFM TV, but as yet local authorities haven’t been able to verify the claim as yet (funny, same similar story, eh?) with Paris counter terrorism operatives now investigating the situation. In response to the latest terror attack in France, Emmanuel Macron sent out Interior Minister Gerard Collomb to the scene. Since, perhaps he was already too busy? This latest Islamic terror attack by ISIS comes after a string of terror attacks starting in 2015, commencing with the mass murder of political cartoonists at Charlie Hebdo, along with 130 other people killed in that Rock concert in Paris, where plenty more people were maimed for life in the shooting, followed by plenty of terror truck attacks such as on Bastille Day in Nice, all in the name of ISIS. Plenty of other Islamic terror related incidents have been rife, since Hollande, Macron and the EU have spread their loving arms around the French people with Democratic socialism, leading to widespread terrorism. For instance in another unheard of attack, in Marseille last October, two women were stabbed to death in the name of Islam outside their main train station, which went largely underreported. Wow! How is it all going to end? Well, do not worry, since Interior Minister Gerard Collomb said that Trebes and the surrounding area had dealt with Islamic terrorism before. 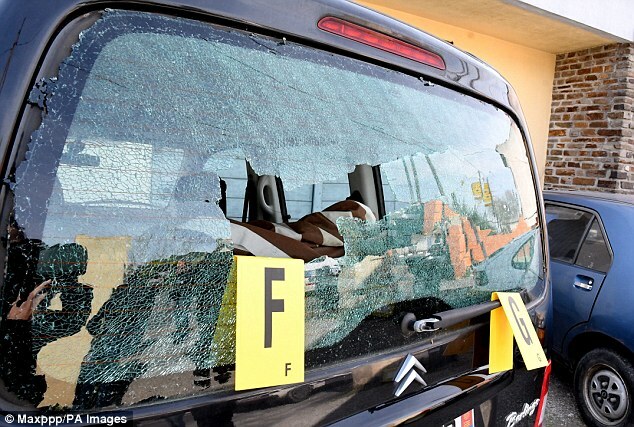 In 2012, Mohamed Merah shot dead seven people including three Jewish schoolchildren in the nearby city of Toulouse. So, do not be alarmed, France is used to this by now. So, there you have it! The religion of peace strikes again, but do not worry, in the words of London Mayor Sadiq Khan, “it’s part and parcel of living in a big city”, right? That’s nice and all, but this was in a sleepy town in south western France… When are the EU and their corrupt politicians going to eradicate the problem instead of spending tax money bringing in more potential terrorists, housing them on their people’s earnings, and then making excuses for it when bombs go off and people are murdered, with “Allahu Akbar” heard before each and every attack? Update: The shooter has reportedly been shot and killed by the police, and the situation has been contained. Previous Article← Are Matt Groening and The Simpsons Time Travellers?